Am mutigsten waren immer wieder die Zeugen Jehovas. English. 405 p. : ill. (some col.) ; 24 cm. 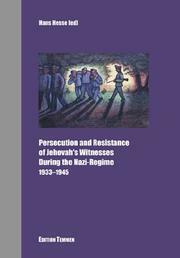 Chronology : development and persecution of Jehovah's Witnesses / Hans-Hermann Dirksen ... [et al.]. Translation of: "Am mutigsten waren immer wieder die Zeugen Jehovas". Includes bibliographical references (p. 387-401) and indexes.